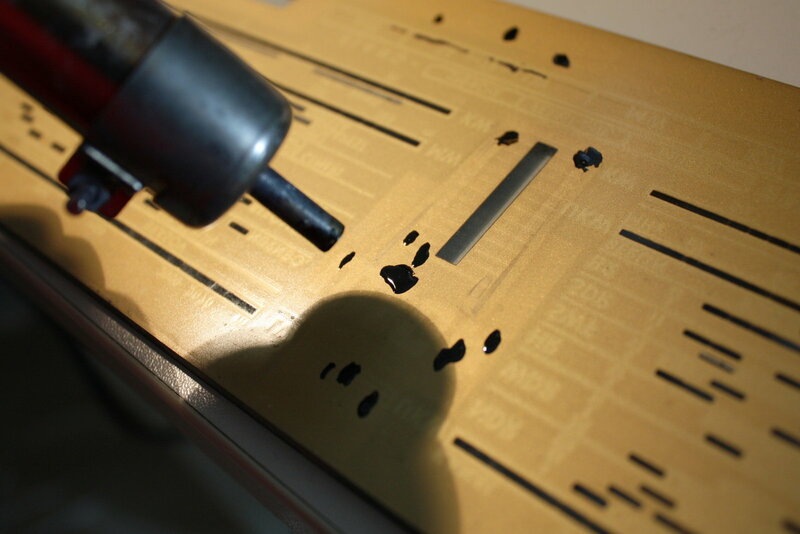 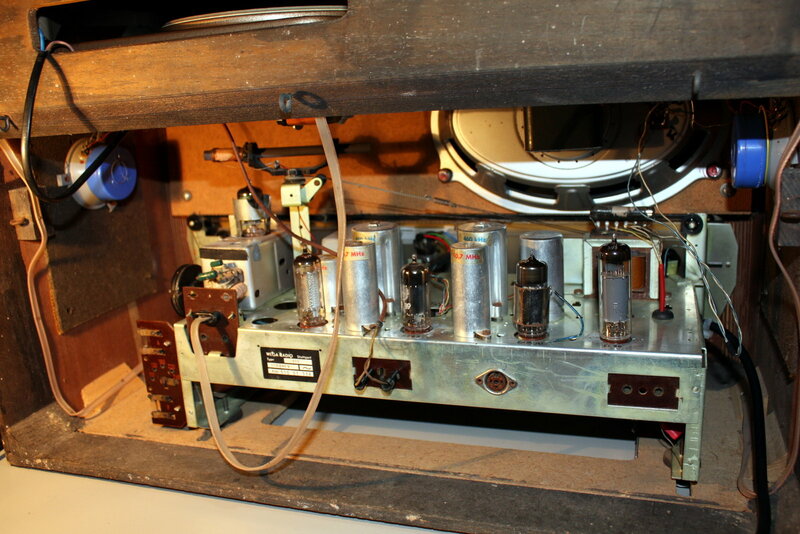 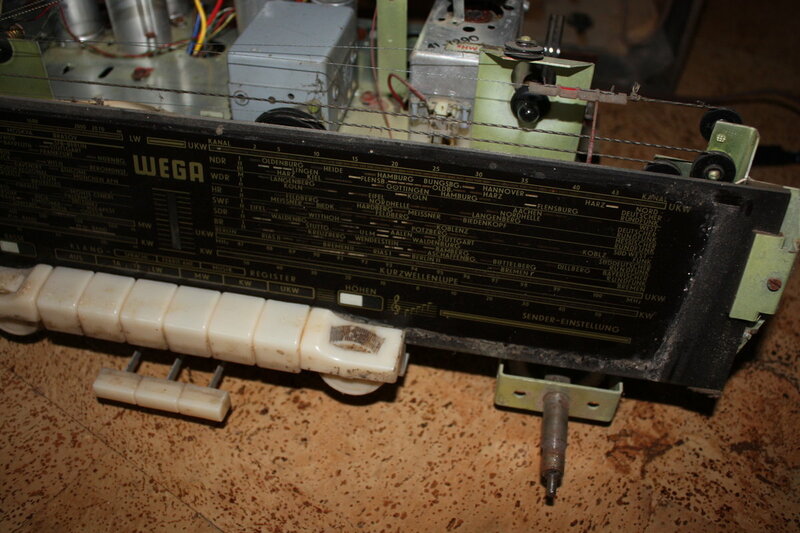 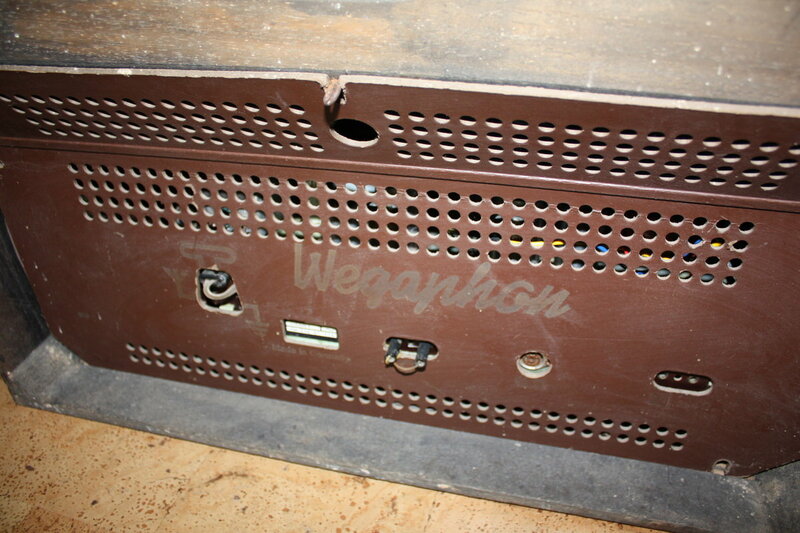 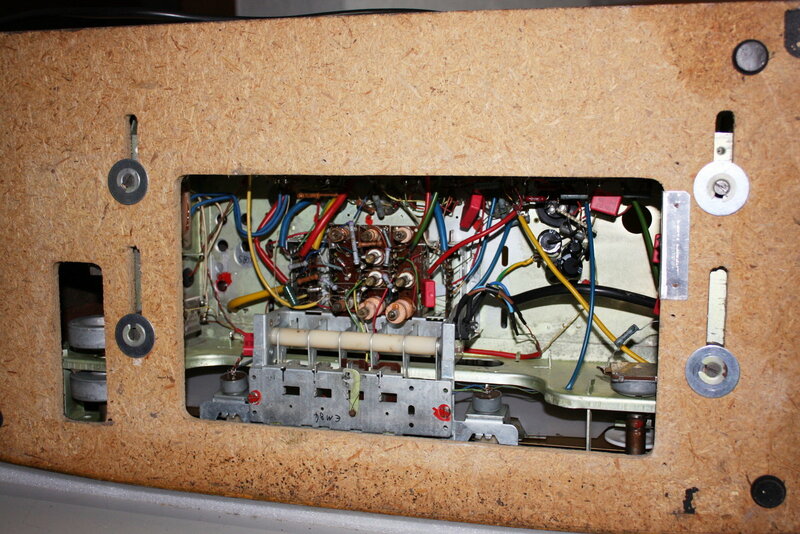 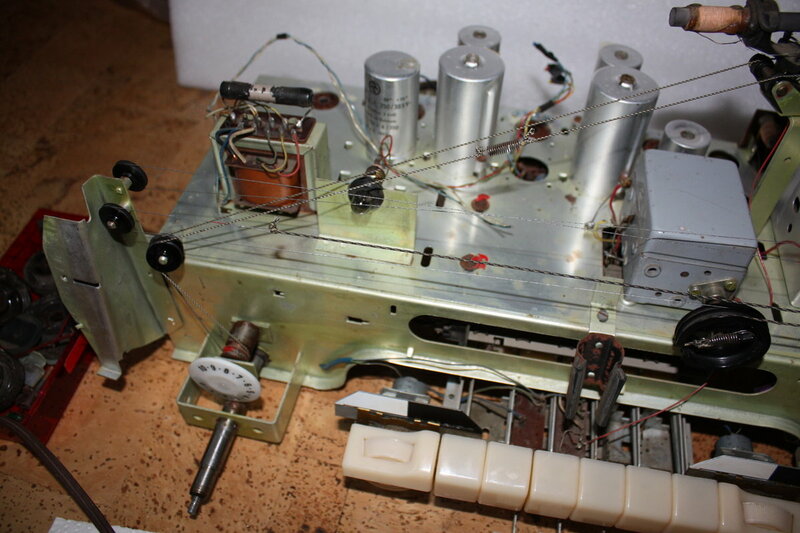 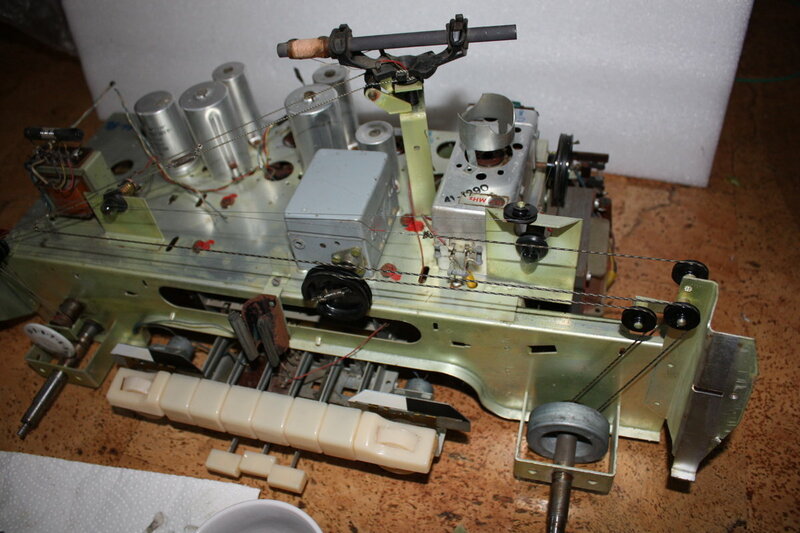 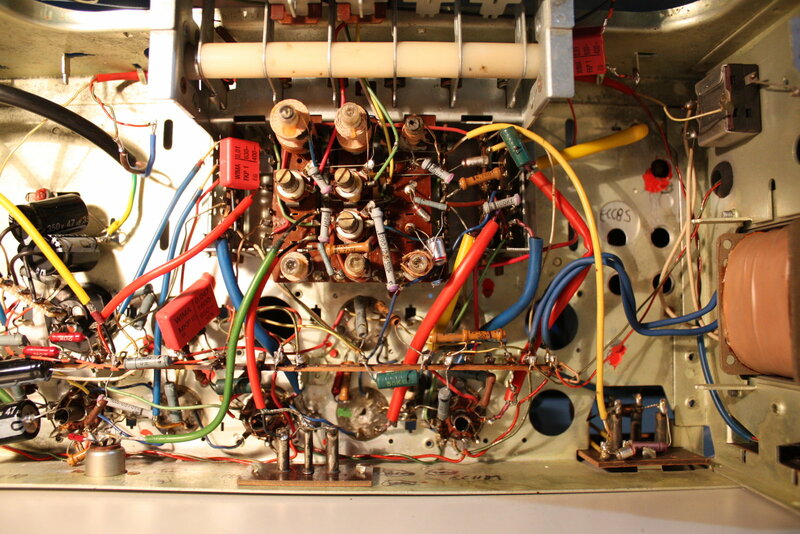 This article shall describe the repair of a Wegaphon W510 produced by the German manufacturer Wega (Radio). 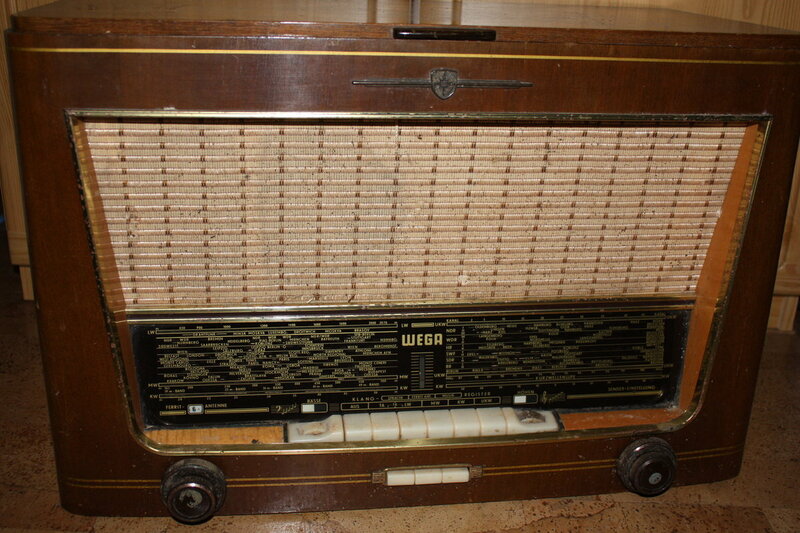 It was produced around 1958/´59. 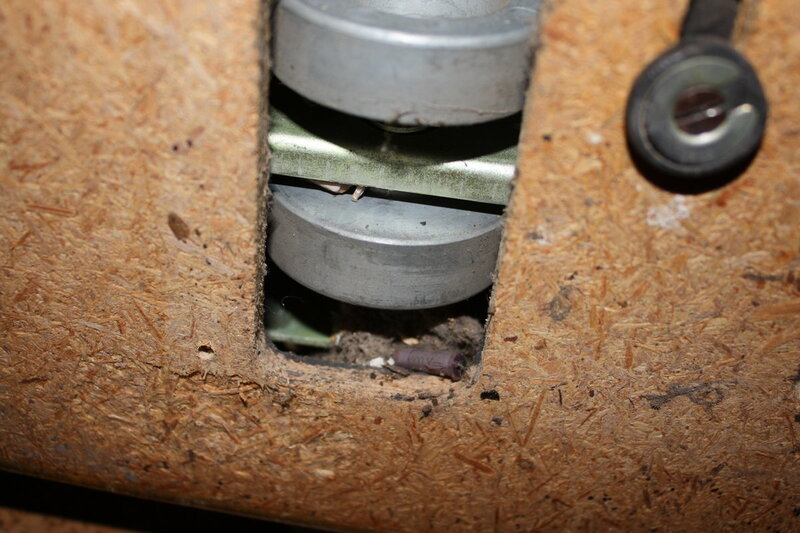 There is a lot of rust, dust and dirt on the case and buttons. 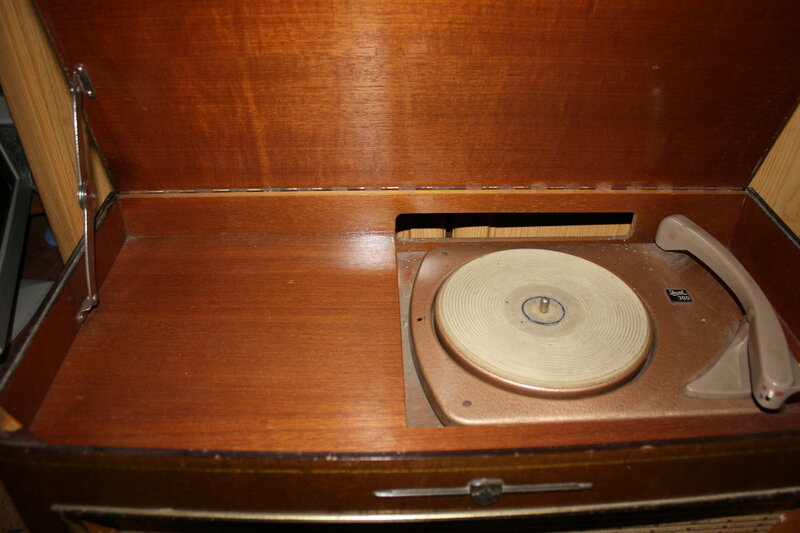 The radio also features a record player module. 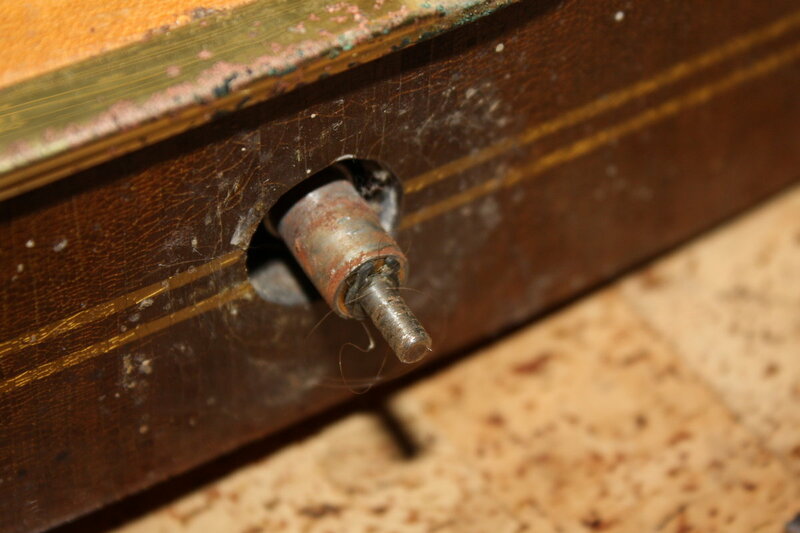 ...and open. 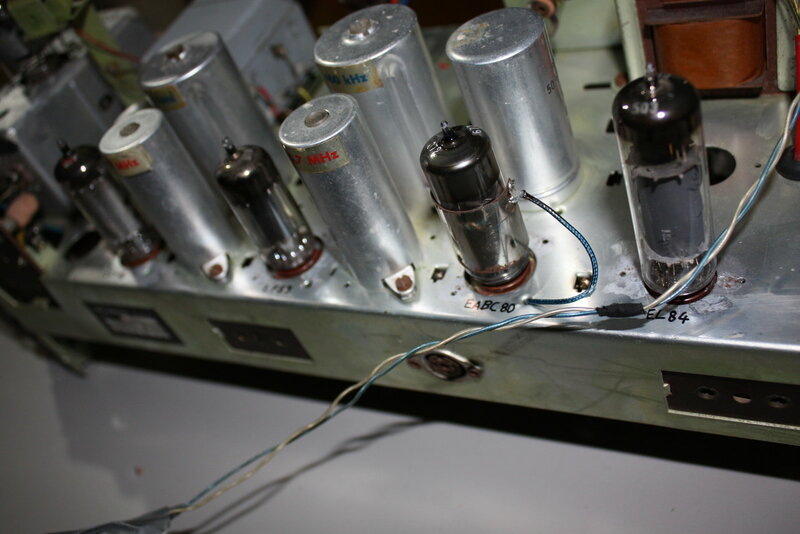 The tubes have already been removed some years ago but I will get them again from the owner. 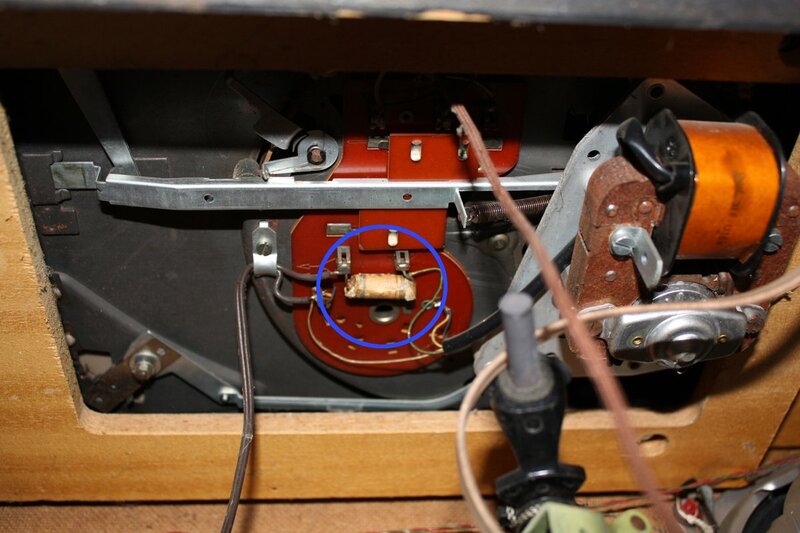 This paper capacitor in the record player (blue circle) is clearly beyond repair - the metal of the drive motor is pretty rusted. 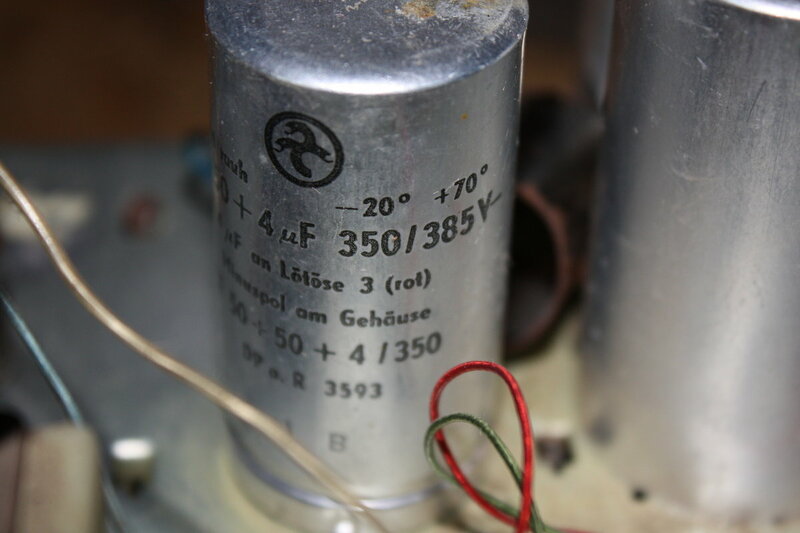 A - hmm - displaced capacitor. 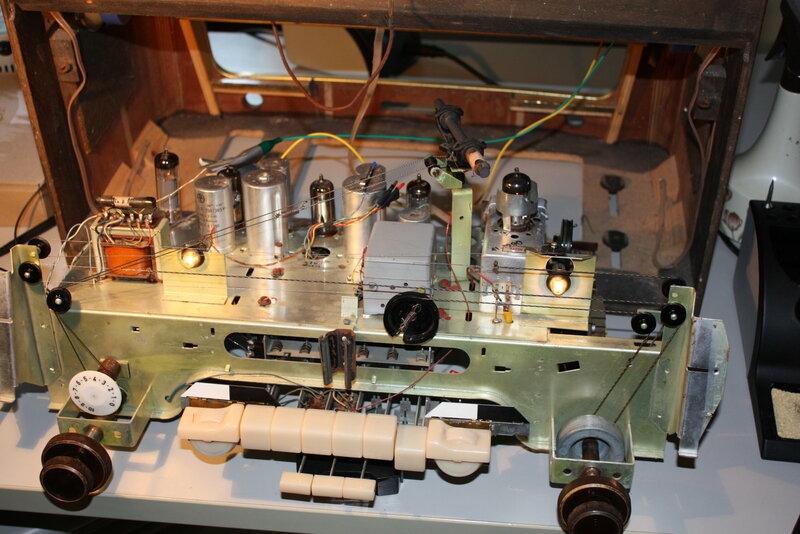 Looking quite good here - all coils and resistors are okay. 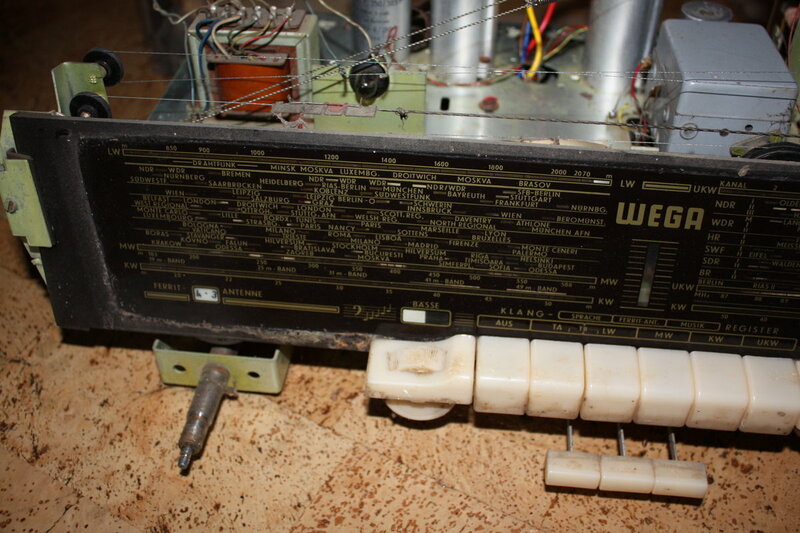 The "Elkonda" capacitor seen in the right background is one of several which I will have to replace. 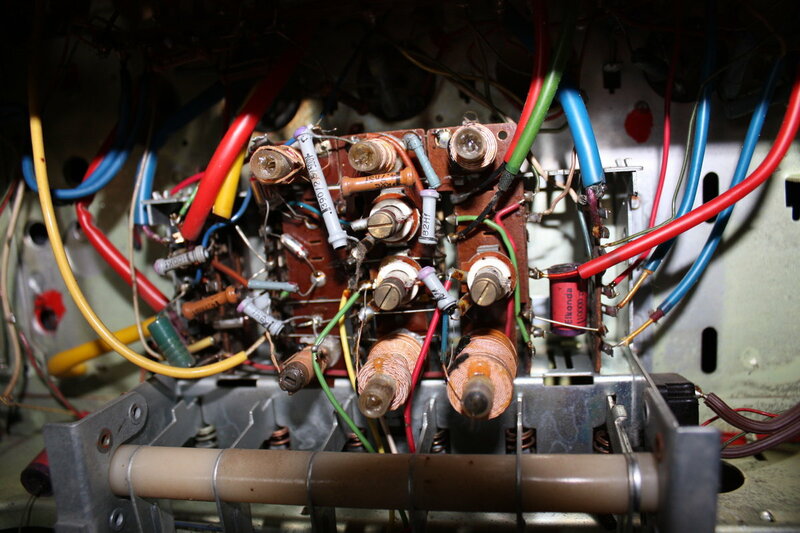 I will also replace all electrolytic capacitors. 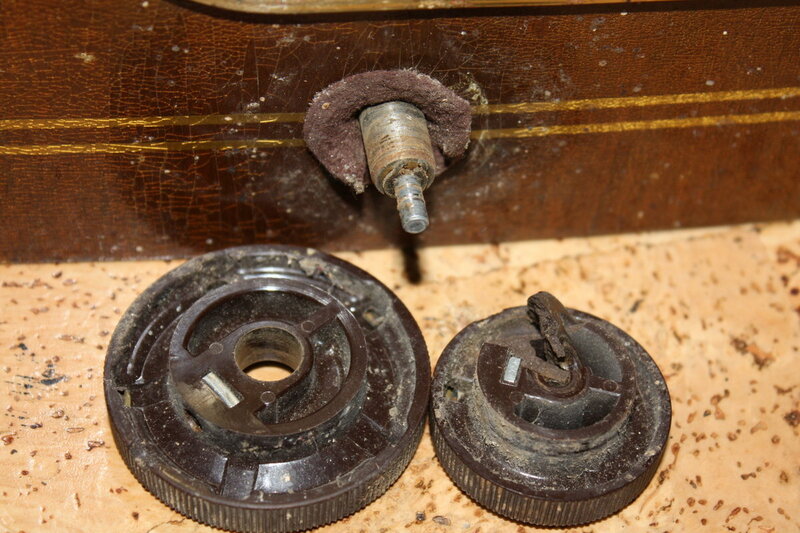 The knobs are in a bad shape. 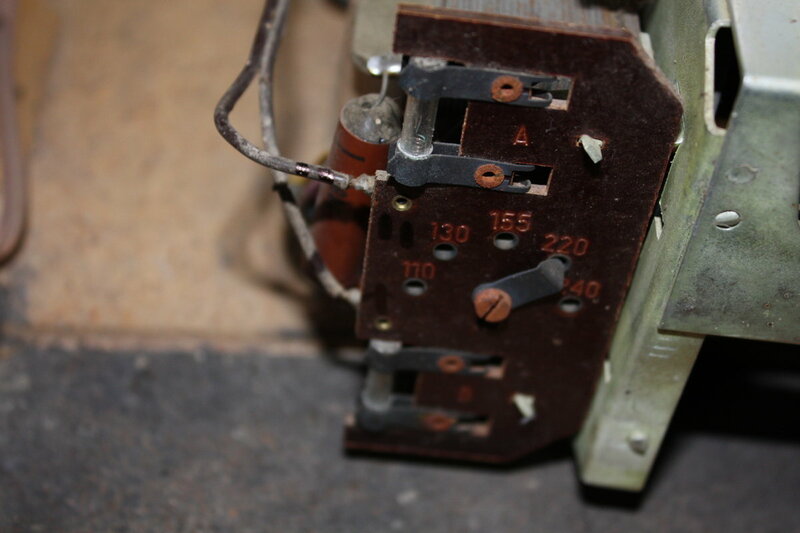 The fuses are rusted and the upper one is blown. 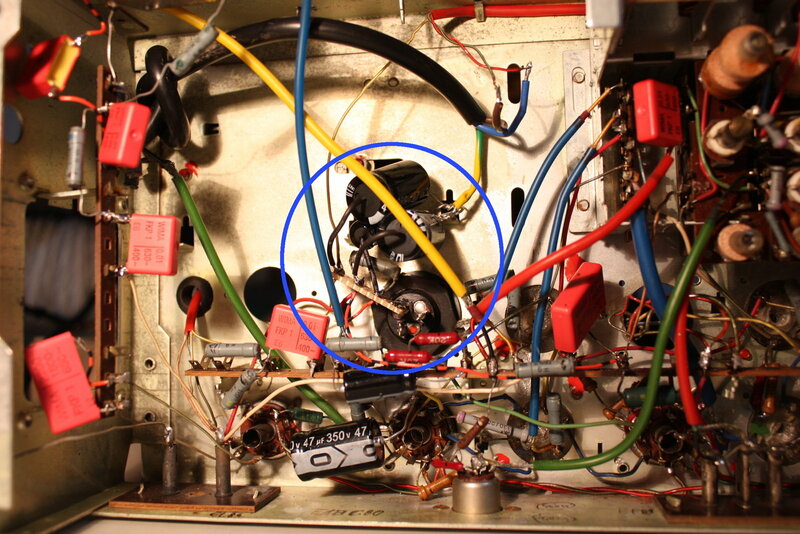 The brown capacitor near the transformer is situated between the power line and ground - I will remove and omit it. 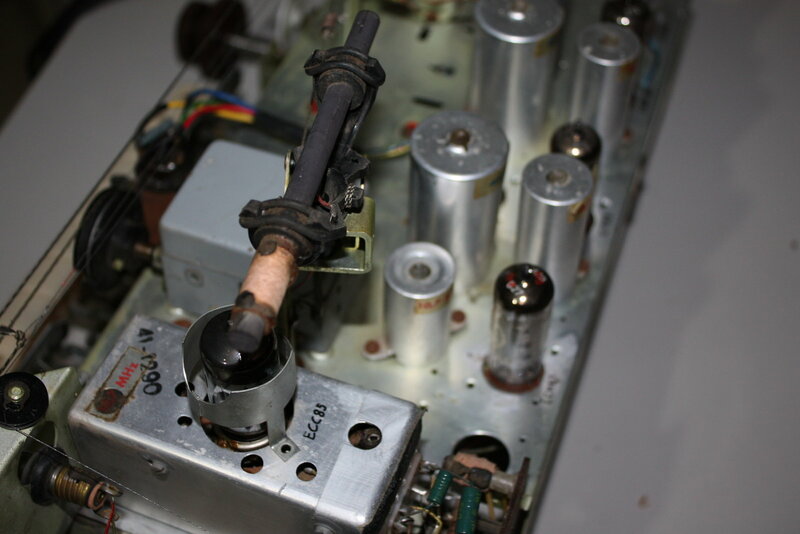 The old can capacitor - it will stay in the chassis but I will cut its contacts and emulate its function by using three individual capacitors. 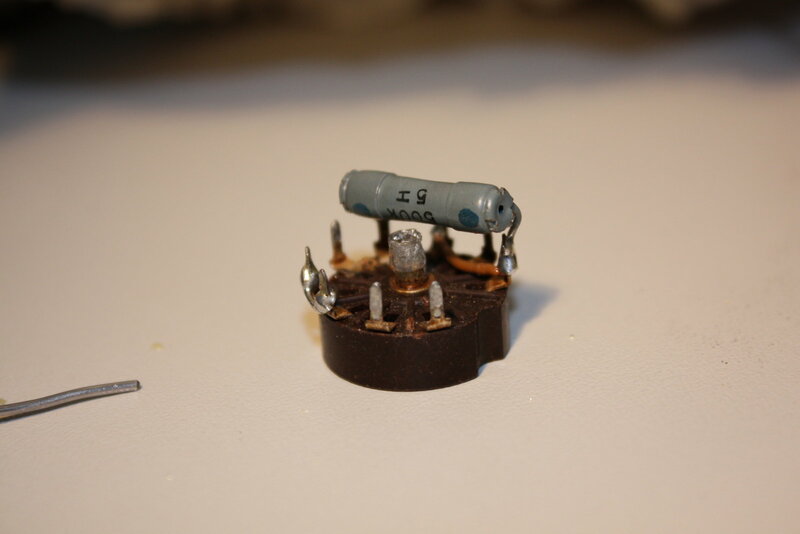 Another - better - view on the purple "Elkonda" capacitors which will get replaced. 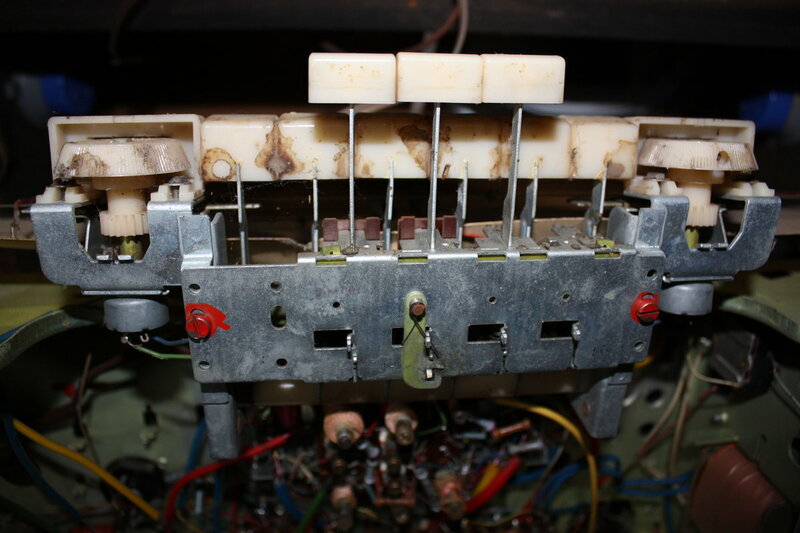 The keyboard looks - disgusting =-) This will require a lot of work. 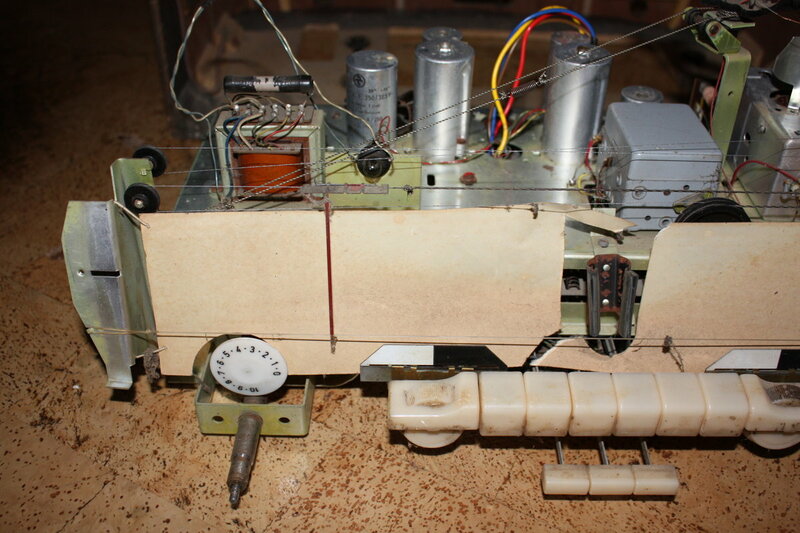 Finally I had some spare time to continue this tube radio project. 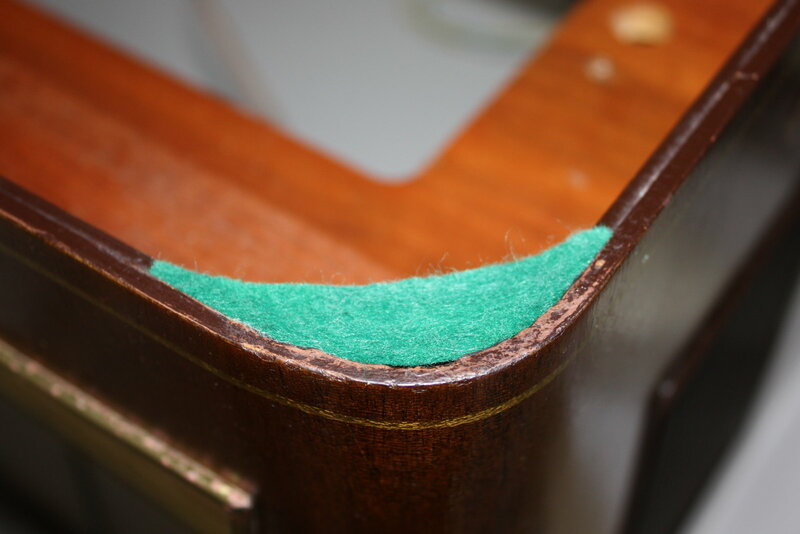 Cleaning took many hours of work. 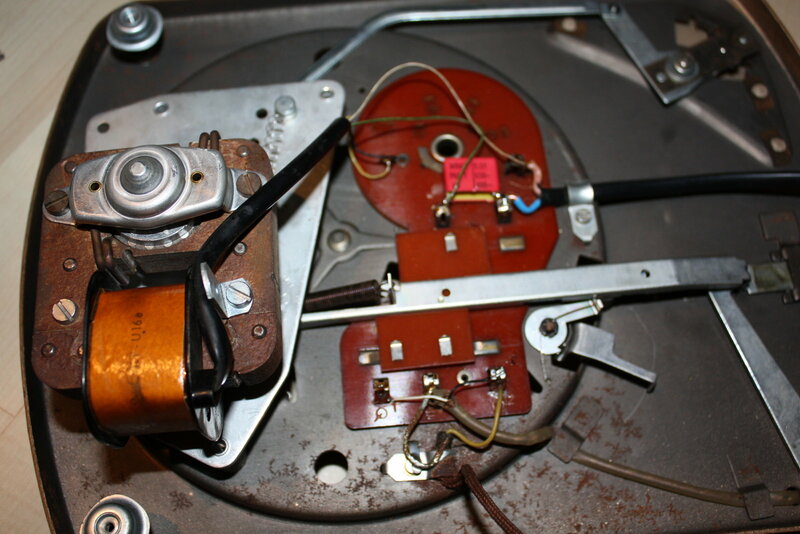 The following pictures show the aftermath. 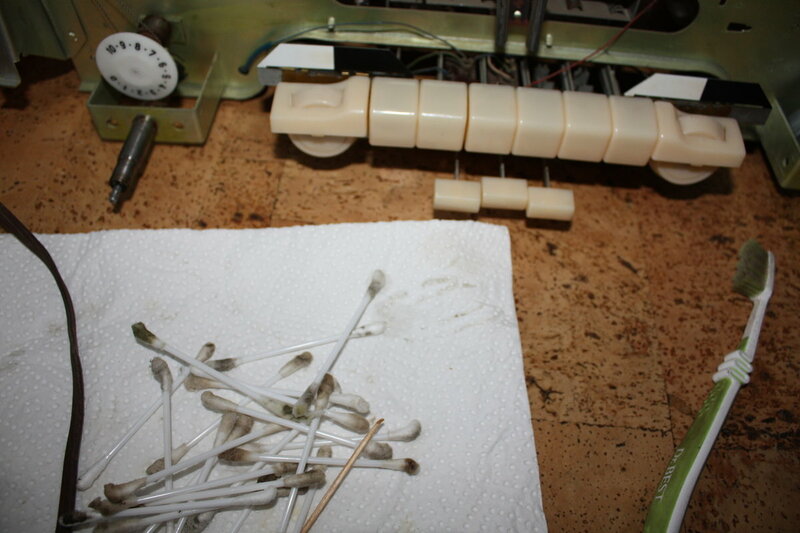 To get there, I needed a bunch of cotton swabs - and sooo much time. 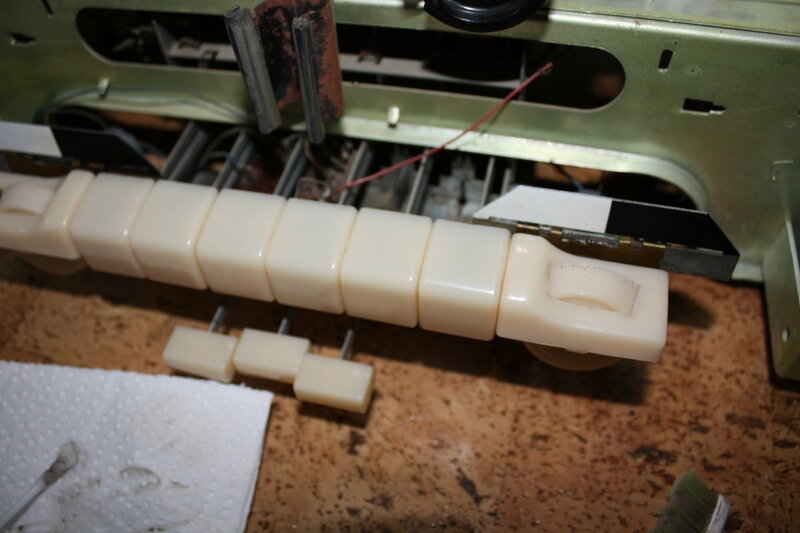 A closer view of the keyboard. 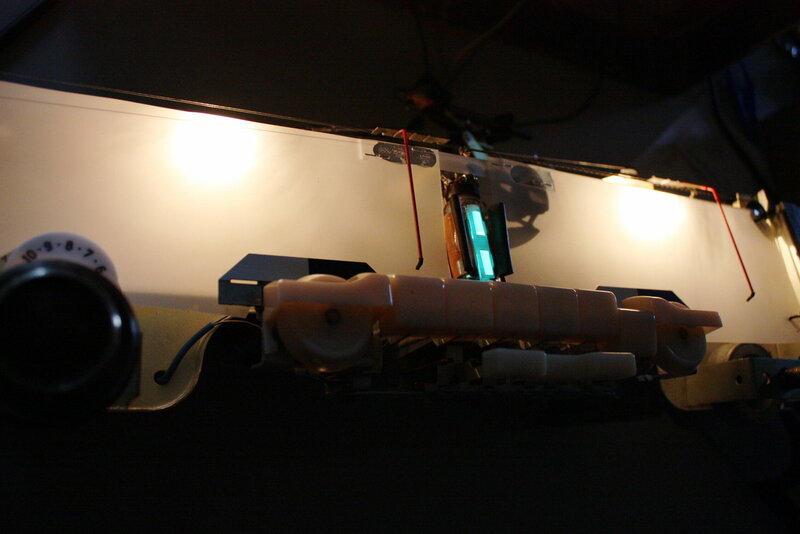 The chassis as seen from below. 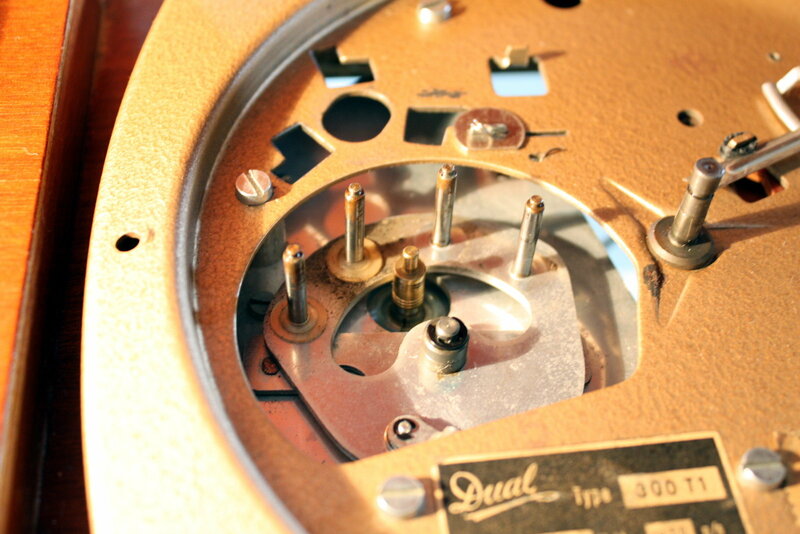 I also lubricated all rollers and bearings with new oil. 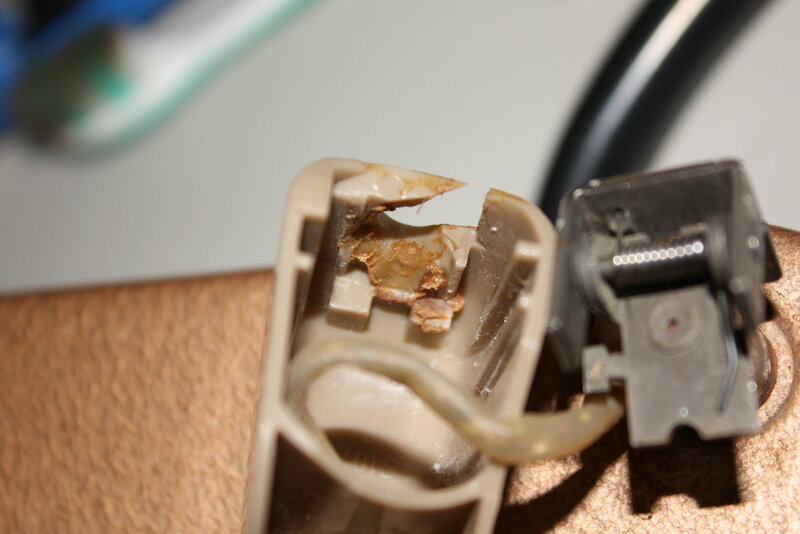 So much for today. 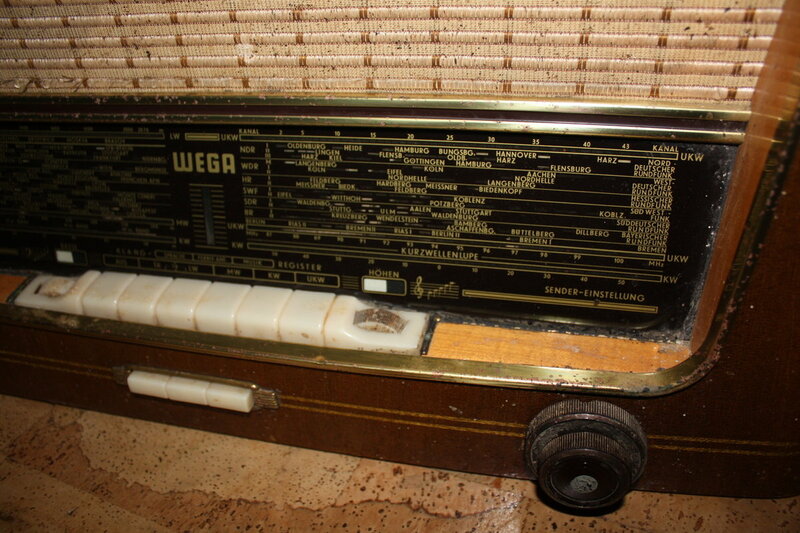 Almost a year has passed since the last post here - time to get back to the radio. 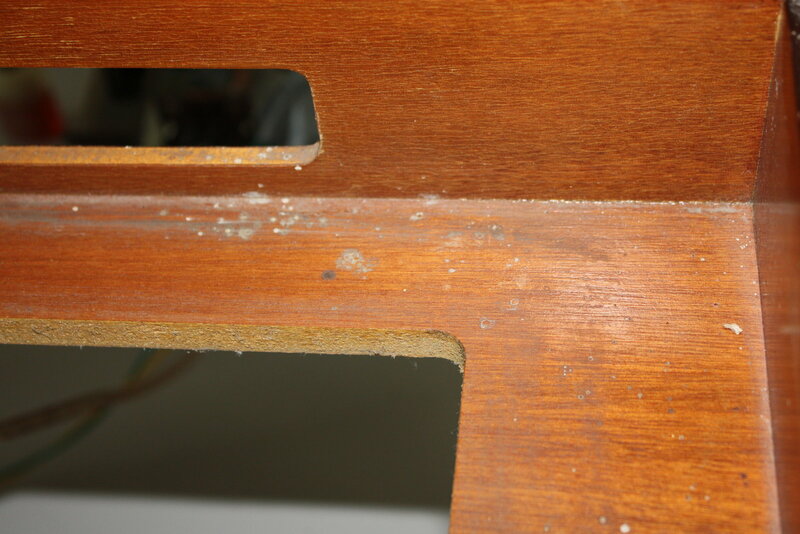 The photo below shows what has happended in the last few days. 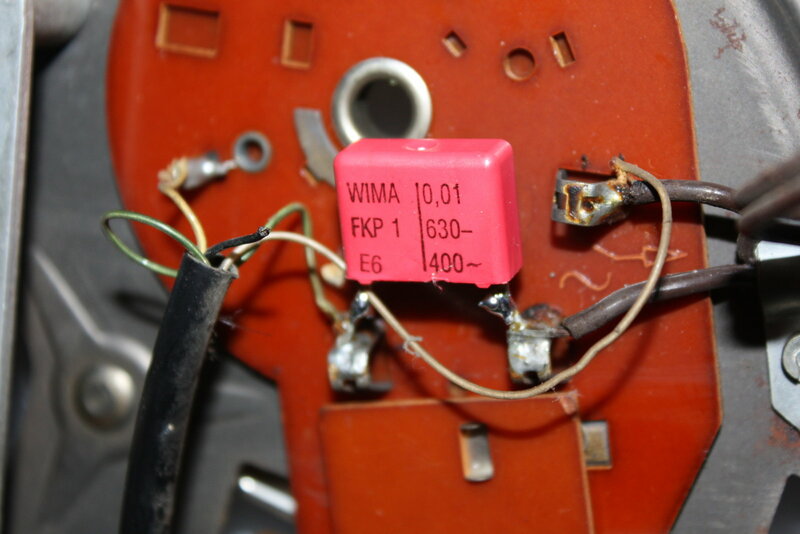 The old Elkonda capacitors have left, the new Wima caps have arrived. 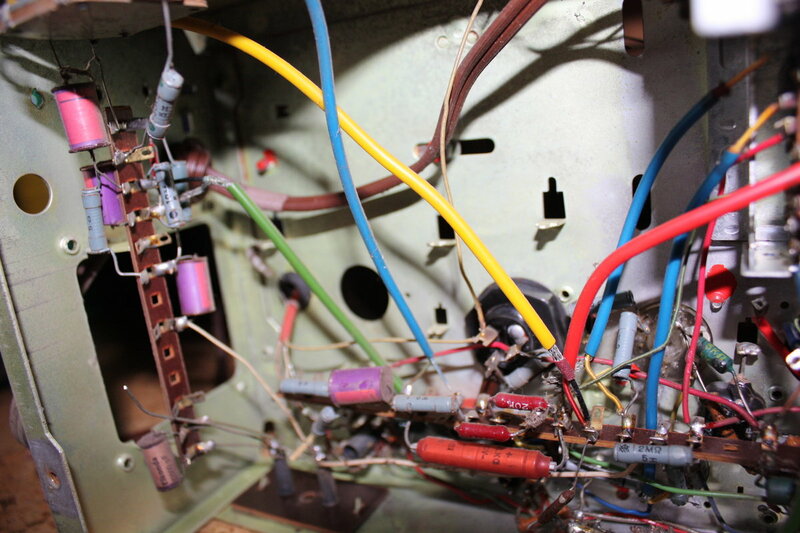 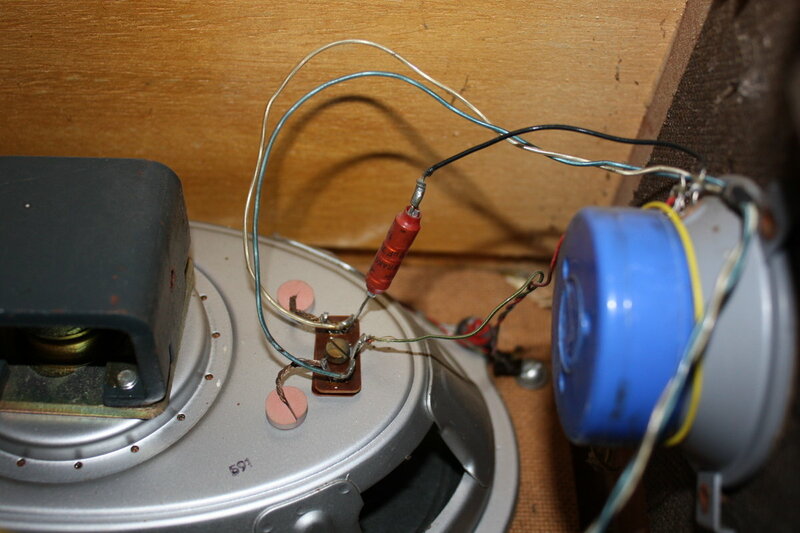 In addition I used three electrolytic caps that will do the job of the ancient can capacitor (blue circle). 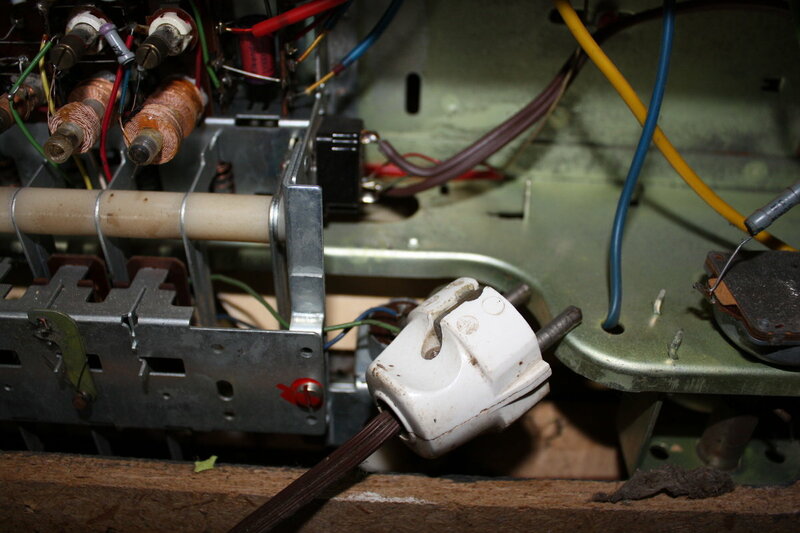 The old "Preh" power switch is dead. 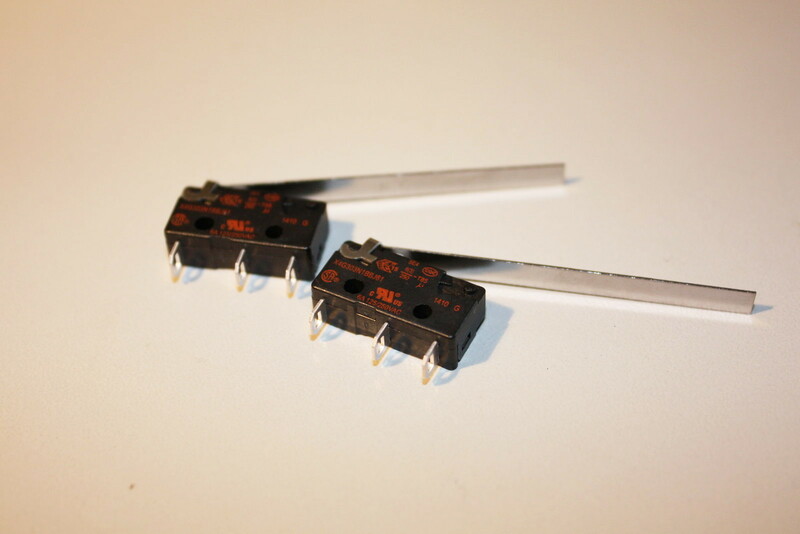 As the picture above shows, it is a double action switch. 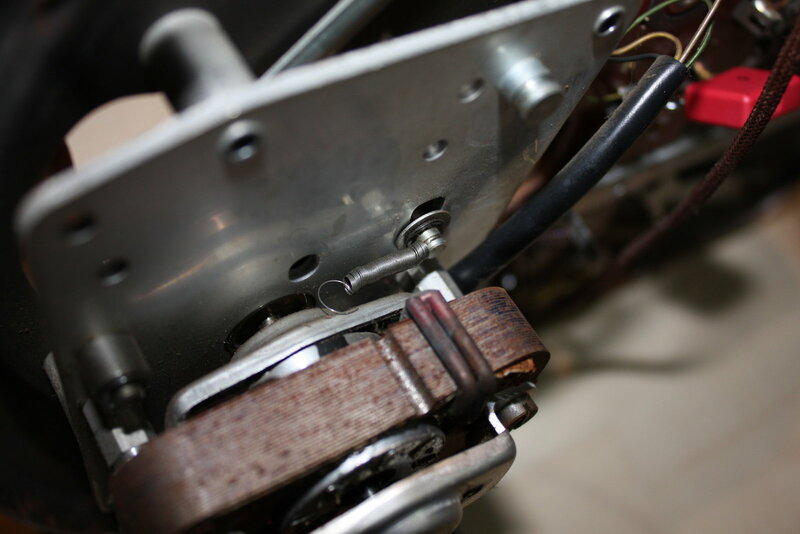 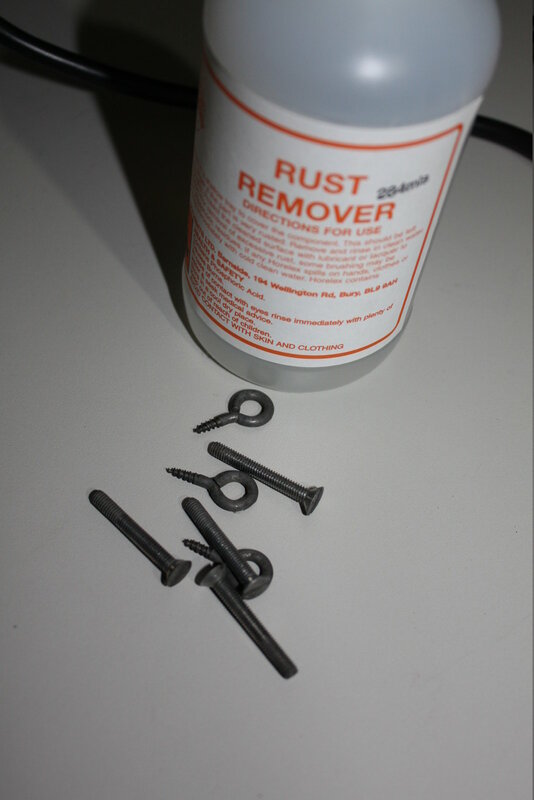 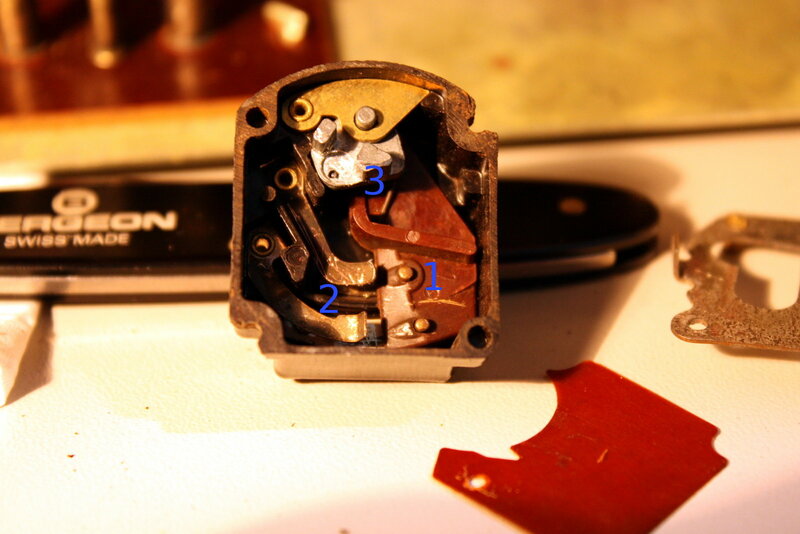 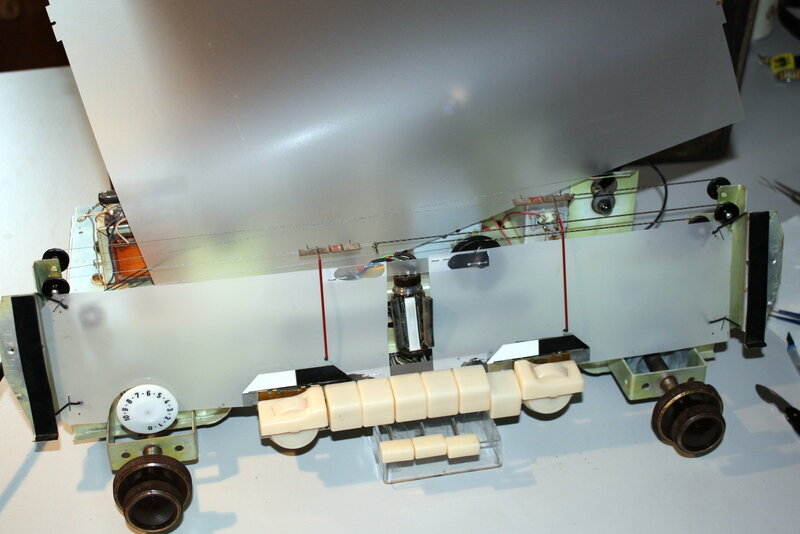 The two metal bolts in the brown plastic part (1) bridge the contacts in the middle (2) when the metal switch above (3) is flipped. 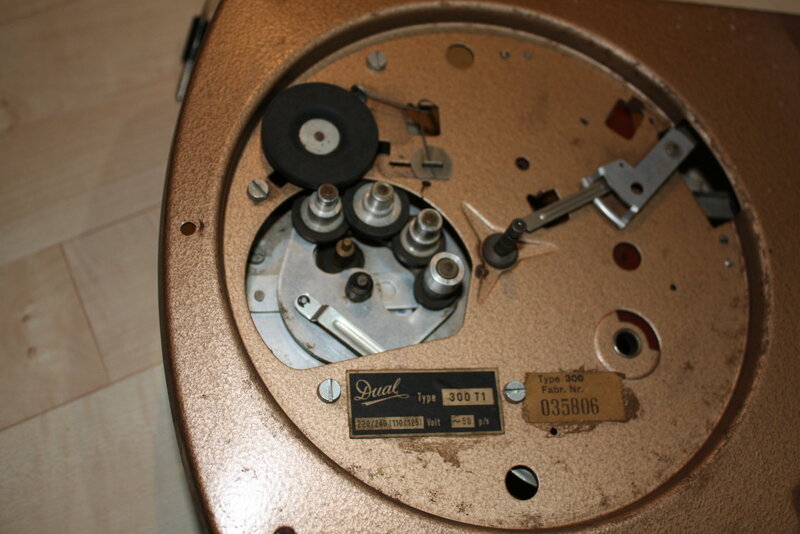 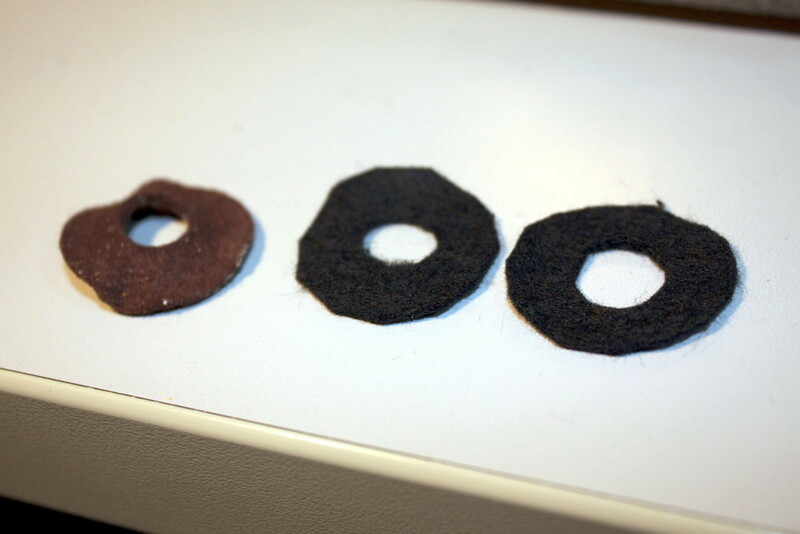 However, the plastic bearing of #3 is broken beyond repair. 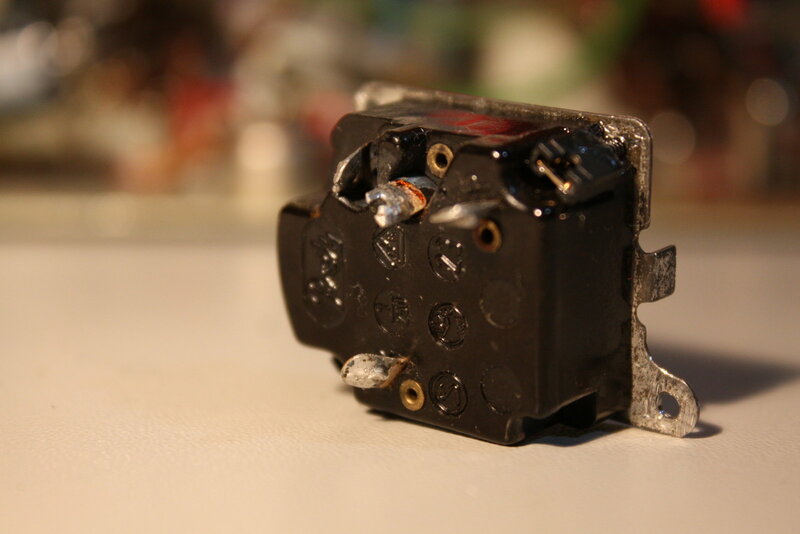 I will search for a better solution to get this repaired as this kind of switch isn´t produced any more. 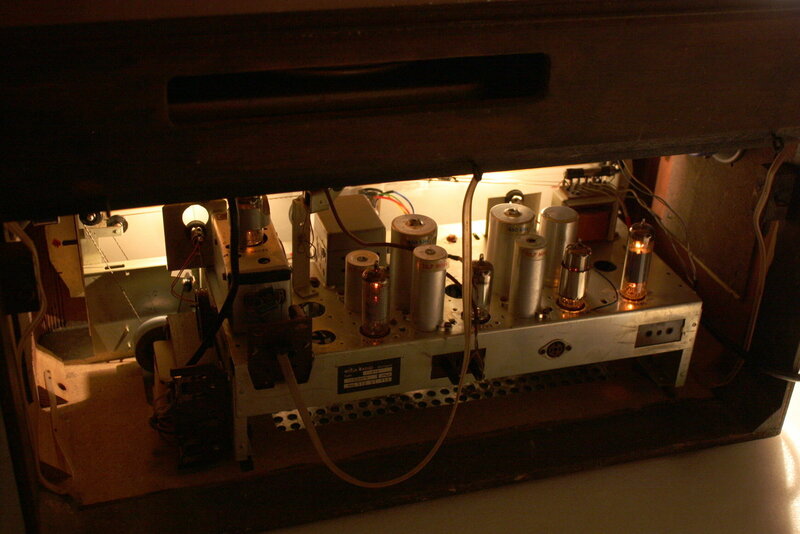 All of the tubes appear to be perfectly preserved. 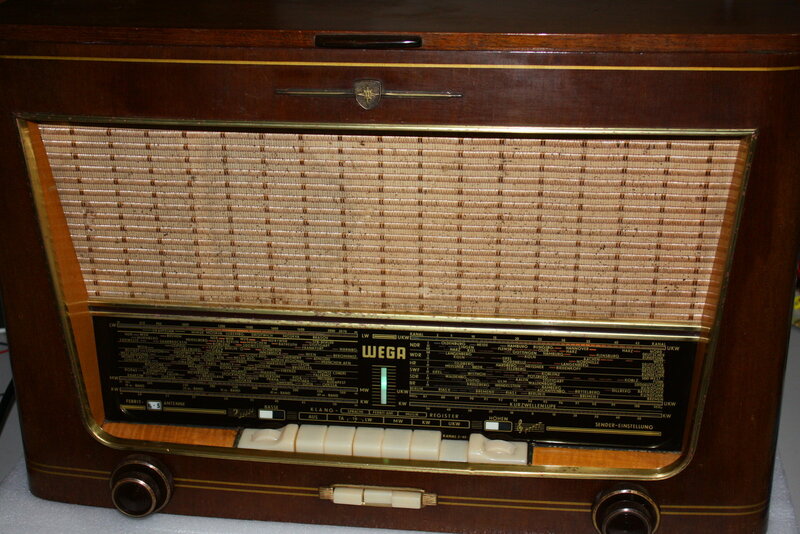 The radio plays and already sounds great. 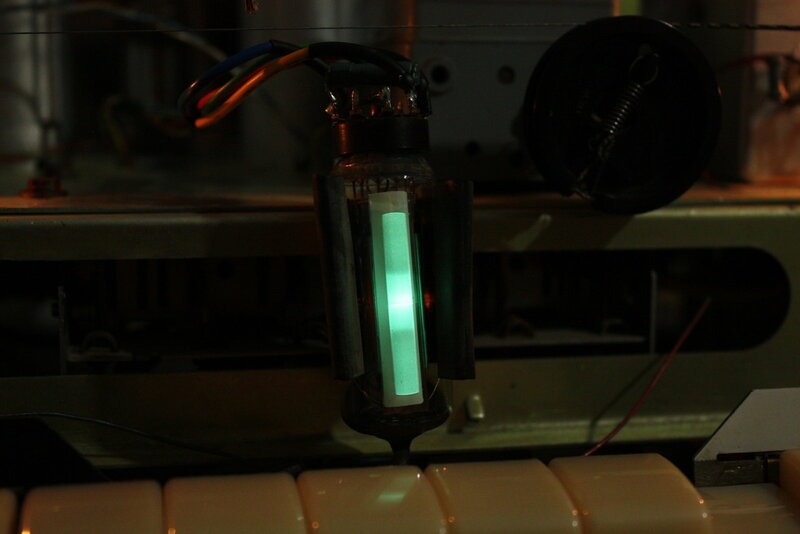 Next, I prepare a new tube socket for the EM84 (a magic ribbon indicator tube). 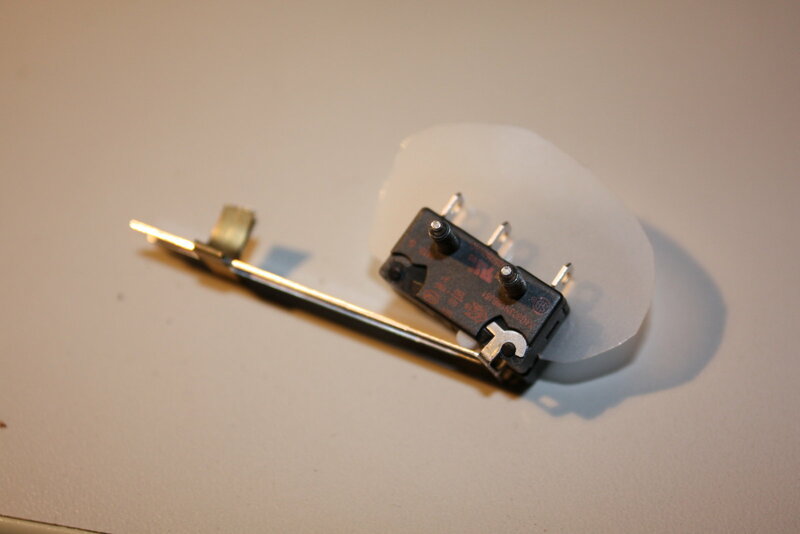 The only real "hotspot" is the EL84 power pentode which appears to be some 30 °C too high. 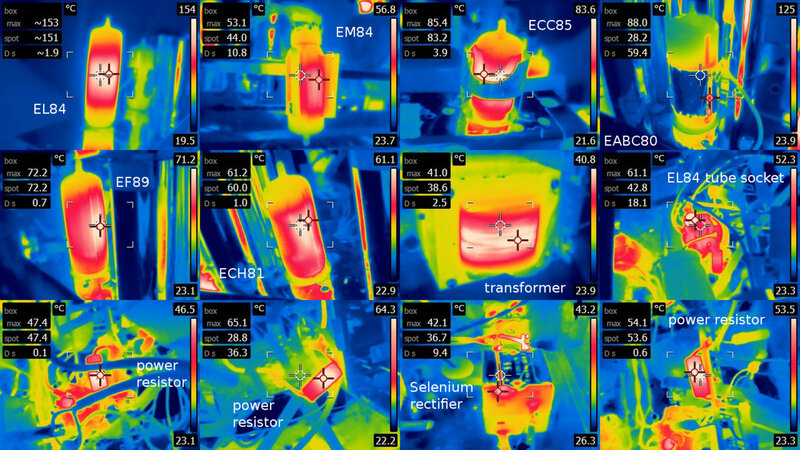 However, I assume it´s okay nevertheless, as the thermal image shows a mixture of the lower outer surface temperature mixed with heat transmission picked up from the much hotter cathode inside (several hundred deg´s). 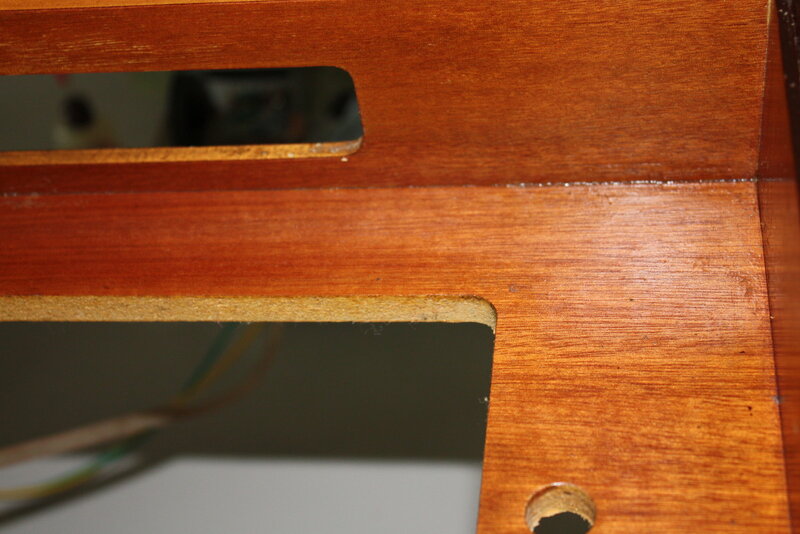 Just some impressions from renewing the wooden case. 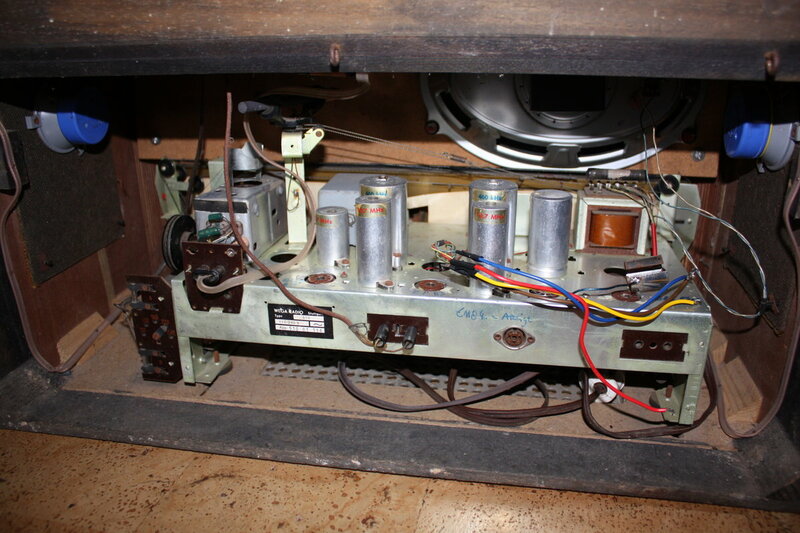 The record player with a new capacitor. 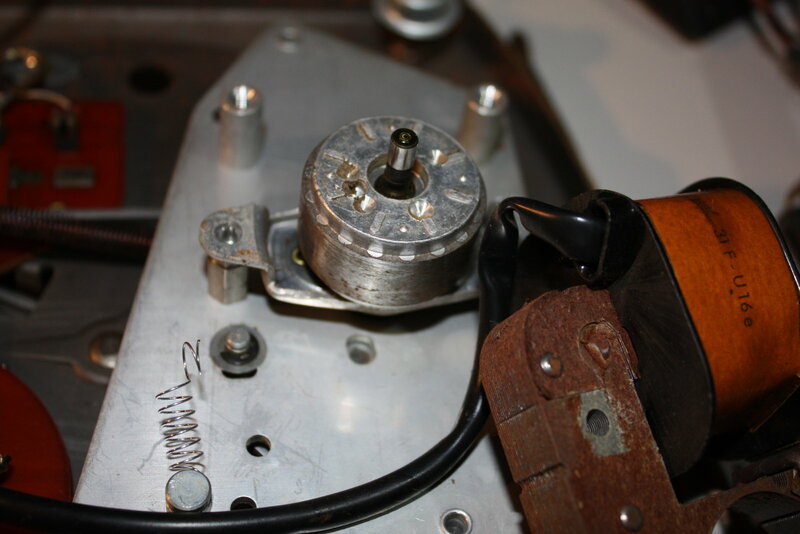 The pickup mounting is broken. 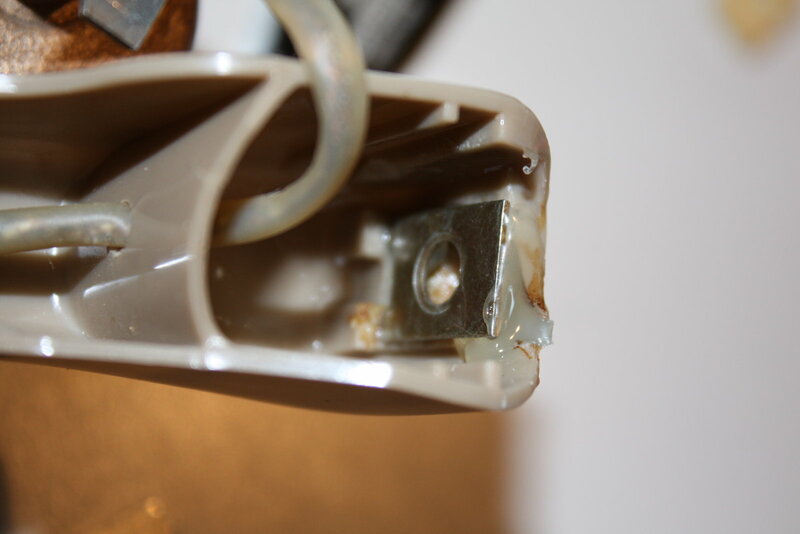 I repair it using some metal and hot glue. 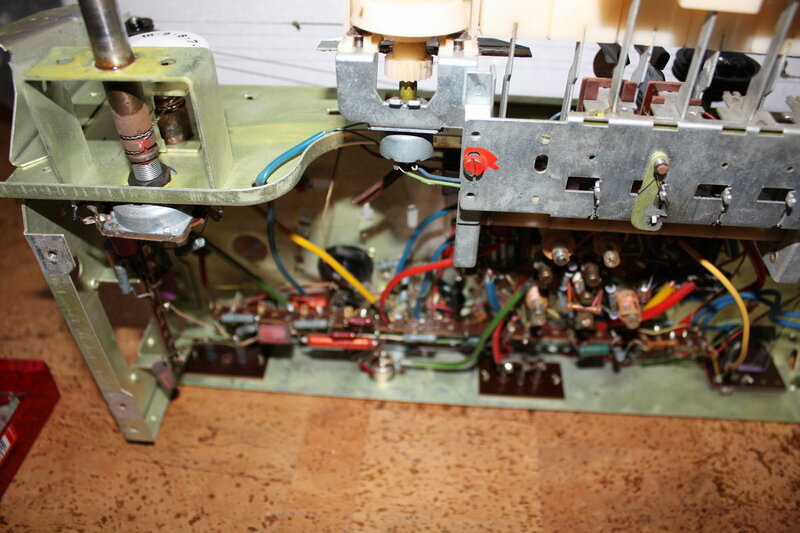 Here the documentation of the final steps in repairing the radio. 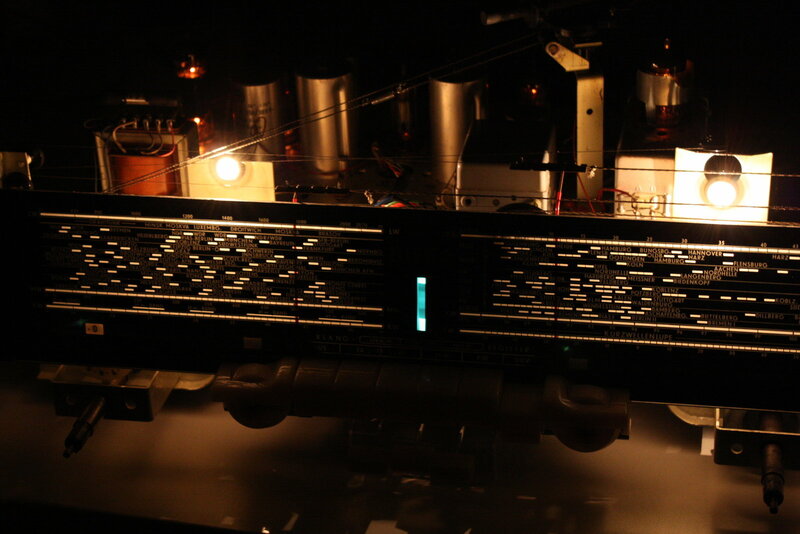 With diffuser foil salvaged from an old LCD screen, I managed to get a uniform light distribution behind the scale glass.